Adithis Amma Sews - Cute Confessions of a Sew Addict: Creative Blog Hop - Meet Shruthi from Mindful Meanderings! Creative Blog Hop - Meet Shruthi from Mindful Meanderings! So whom do we get to meet this wednesday, get ready to meet the Artsy Craftsy mom in blogland! Shruthi from Mindful Meanderings, where she shares her expeditions in Art and Craftg along with her cute daughter whose internet avatar is popularly known as Lil'P! Mindful Meanderings is truly addictive and from starting off as window to share her creative sojourns with darling daughter, it has grown to be a space where readers can share their creations, categorized as per the theme / flavor of the month. Before we get started with the interview, i would like to let you know, that you can link up your latest projects in the LINKY at the end of the interview! Shruthi, I am really happy to have you here on Adithis Amma Sews as part of Worldwide Creative Blog Hop. Welcome! 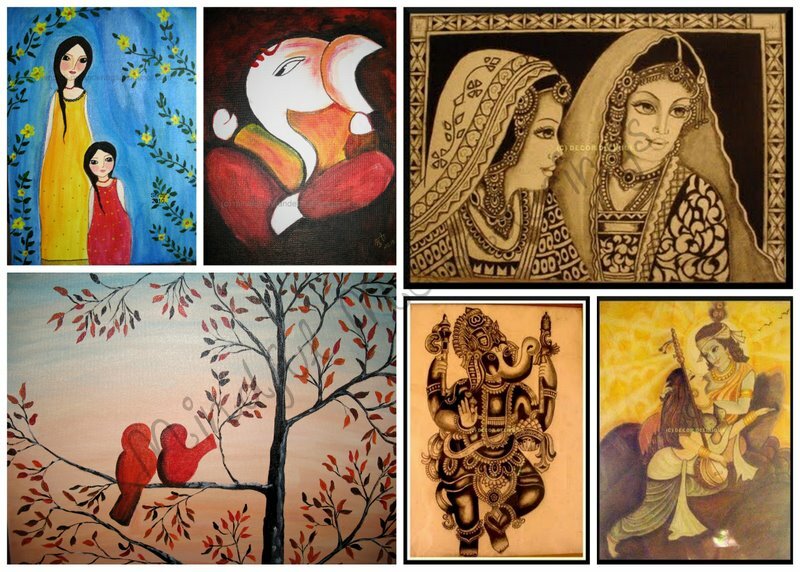 Thank you Lakshmi for inviting me to this Blog hop and introducing me to all your friends here.. I'm Shruti, a software professional by day and an avid crafter by night. I blog over at Mindful Meanderings where I write about my family, our travel tales and all the crafty stuff I make. I stay at Bangalore - the software hub in India with My Husband and my 5 year old daughter - Lil P.
What made you start a blog? Your inspiration? Way back in 2009, I noticed that quite a few of my friends had taken to blogging about their kids.. My daughter, Lil p was also at an age when I felt the need to jot down her growing antics. It was also a time when my love for arts and crafts was reviving.. I took to blogging as a means to share the fun stuff with friends and family. Did you expect Mindful Meanderings to be so popular when you started off? Actually, no. It started off as an online diary and when people started commenting and appreciating some of the crafts that I made with Lil P, I was inspired to try some more crafts. The monthly Artsy-Craftsy challenge was born. Its been 2 years since and there has been no looking back. Your blog shares your bond with your daughter as much as it shows your artistic sojourns! How does it feel to be looked upon as 'Ideal mum' who dons multiple hats, successful employee at an MNC, doting mom, avid artist, How do you manage time to pursue your crafting passion along side a full-time job + doting mom + caring wife! I don’t sound to be preachy, but I truly believe each mom is an ideal mom.. an ideal mom for her kids. I do have my off days when nothing works as planned, but most days are good. I blog once my daughter sleeps and also use the scheduling facility of blogger a lot. At office I’m deeply passionate about the work I do there and once I am home, we unwind the day with a lot of kiddie crafts. I’m lucky to have good support staff - a good cook and a maid who help me focus on the things I love. Crafts which you would love to learn in future? How can one help their child to bring their creative talents to the fore, What is your tip to all those moms n dads out there ? Keep trying new stuff with them, Give them a dedicated space and time for their creative endeavors. Make cards, let them get their hands dirty,use stuff lying around the house - make a potato stamp , or paint a stone from your backyard and make it fun. Art can also be used to teach kids about our culture and Folk crafts. It is equally important to display the crafts once your child has made them. Frame it, Print it, hang it where everyone can see it. Appreciation and creative freedom is the key to develop a child’s interest. I know this is a tough one to choose, your personal favourite among your creations? Ohh this is a tough one.. My personal favorite will have to be Lil P’s painting of us as a family for its sentimental value.. then the rainbow fish &thumbprint aquarium remains to be a family’s favorite.. 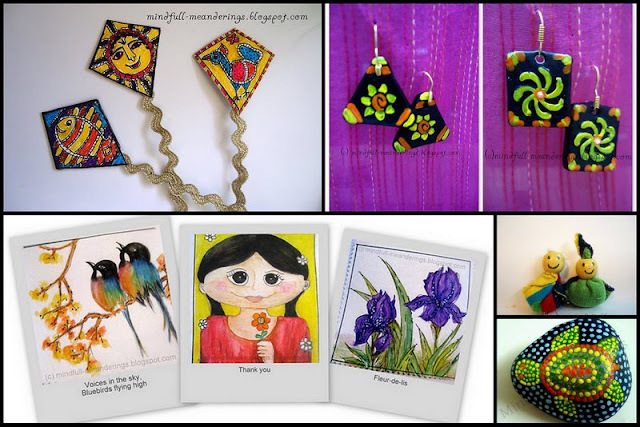 I also love the Madhubani bookmarks & sock gnome key chains that I made for friends. How has blogging helped you evolve as a person, what do you love the most about blogs? What is in store for Mindful Meanderings in future? 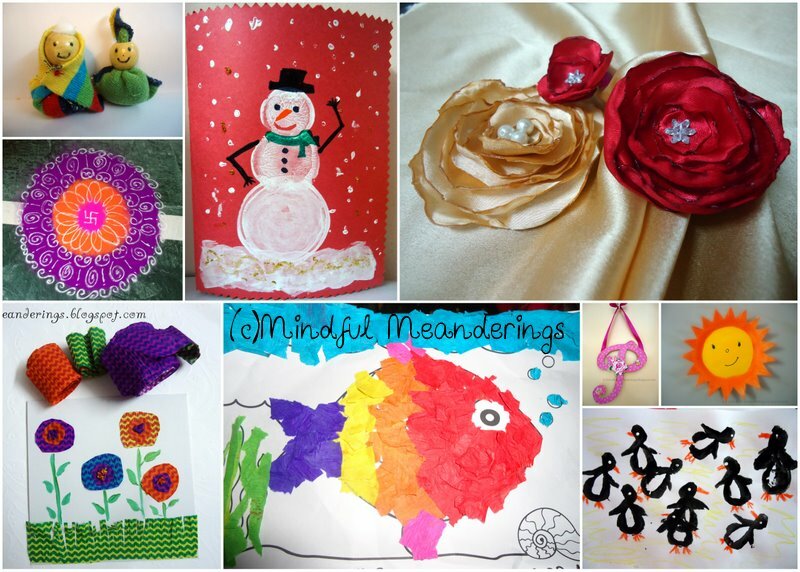 We have the monthly Artsy-Craftsy that focuses on a theme – This month’s theme is Create your own Van Gogh. The focus is to introduce children to the famous artists of the world. The Yummy Tummy series featuring food stories and user submitted kiddie recipes every Wednesday & then the BookWorm Fridays where we review a set of Childrens books every Friday. Maybe another series that focuses on décor later this year. 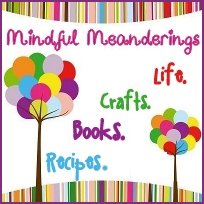 In short, I'm very excited about this and hope that you all will drop by at my blog or FB page and come be a part of the Mindful Meanderings family. Thanks once again Shruthi for your valuable time and i am sure readers are off to check out Mindful Meanderings. Stay tuned and we will get to meet 2 more talented craftsters / artist this month as part of our Creative Blog Hop! Another great interview! 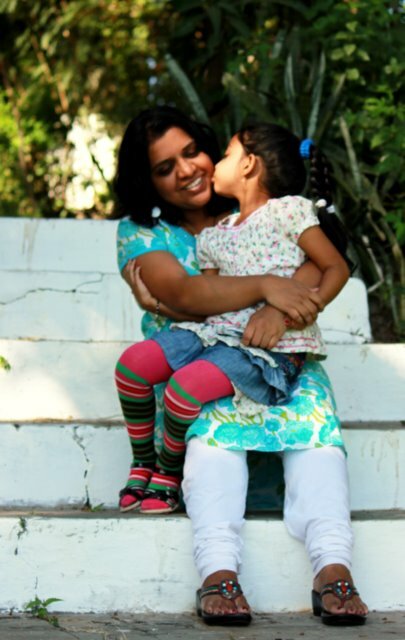 Shruti's blog sounds brilliant -and I'm headed over there right now to check it out! Thanks for introducing her to us! Awesome interview with Shruthi! She does some amazing artwork!